The fifth installment of the legendary and influential series of dark jRPG games, set in modern Tokyo. The production was created from scratch for the Nintendo Switch console. A jRPG for the mobile platforms. The game belongs to the renowned series Shin Megami Tensei. The title uses solutions known from the console entries in the series. A two-dimensional platform game that is part of the promotional campaign for Shin Megami Tensei: Strange Journey Redux. The players assume the role of a cold demon Jack Frost and they travel through various locations while facing challenges and hordes of enemies. The game features some RPG mechanics. Another installment of the popular series of jRPG games based on books written by Aya Nishitani. The title was produced and released by Japanese studio Atlus. Shin Megami Tensei IV: Apocalypse takes the player to ruined Tokio of year 2030 in which armies of demons are fighting the angels. The player assumes the role of a warrior who after dying comes back from the afterlife as a servant of deity Dagda. The resurrected warrior can tame demons and force them to fight on his side. The player travels through three-dimensional locations presented by using third-person perspective. On his way there are NPCs with whom he can talk and there are monsters to defeat. The battles are turn-based and they take place on special arenas. During the encounters, the player is accompanied by one of seven companions and by three demons out of more than 450 available. These creatures can be combined in order to obtain a more powerful unit. 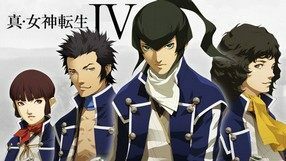 Shin Megami Tensei IV: Apocalypse offers three-dimensional anime-styled graphics. The gameplay is accompanied by heavy, climatic music. Shin Megami Tensei is a classic Japanese RPG, originally released on a 16-bit Super Nintendo console, and 22 years later converted to iOS. The action takes place in Tokyo, and players take on the role of a high school student, who gains the power to contract with demons, who then help him in combat. Shin Megami Tensei IV is a turn-based RPG game developed by the Japanese team Atlus. The gameplay focuses on using the demons recalled to fight against similar beings who took over postapocalyptic Tokyo. Japanese RPG is a side game in relation to the cult cycle Shin Megami Tensei. The action takes place mainly inside the virtual world, used for trading in human souls. The game is about controlling the team of heroes while exploring the underground and fighting enemies. An important part of the game is the system of summoning demons. Shin Megami Tensei: Devil Survivor 2 is a continuation of the Atlus jRPG game released in 2009. Players take on the role of a Tokyo high school student, who is one of the 13 rulers of demons who can oppose the invasion of Japan by a foreign race. The title is a mixture of RPG and strategy elements and is maintained in the anime style. Shin Megami Tensei: Strange Journey is another part of the Atlus jRPG series. The title, which is the second edition prepared for Nintendo DS, strongly refers to the roots of the series. This time the game is about visiting dungeons and catching creatures living there. Shin Megami Tensei: Devil Survivor Overclocked is a jRPG game produced by Atlus. The action is set in contemporary Tokyo, which is attacked by demons. Shin Megami Tensei: Devil Summoner - Raidou Kuzunoha vs the Soulless Army is a Japanese RPG, which is a spin-off of the bestselling Megami Tensei series. The title character is a young man Raidou Kuzunoha, assistant to private detective Shouhei Narumi. The action takes place in Edo, i.e. in the former Tokyo. Shin Megami Tensei: Digital Devil Saga 2 is a continuation of the popular Japanese RPG title. Maintained in manga climates production came out of the wings of programmers from Atlus company. Three-dimensional RPG with turn-based combat system. The plot of the game places the action in an apocalyptic Tokyo post, full of demons, spirits and occultism.